Since I’ve basically exhausted the list of Diners in the Upper Valley, I figured I should review some of the other breakfast joints. I’ll start with one of my favorites: Dana’s by the Gorge in Quechee, VT (umm, by the gorge…). Anyone who regularly dines with me knows that my favorite breakfast items are, roughly in order, biscuits and gravy, pancakes, and waffles. So usually when I’m visiting a place for the first time I’ll have one of these three items. However, Dana’s was different, since one menu item jumped out at me: the Vermont Rarebit (pictured at right). It’s basically an eggs Benedict dish, with the hollandaise sauce replaced with a Welsh-rarebit style cheddar sauce. Very delicious, and I seem to order this 90% of the time I’m there. And, in season, I visit there often enough that they are starting to recognize me. 1. The food is very good, and I’ve never been disappointed. 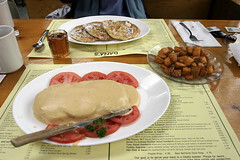 In addition to the rarebit mentioned above, the pancakes (especially the apple cinnamon variety) are very good (indeed, they are on my “best pancakes ever” list). 2. The service has always been very efficient and friendly, and we always find our coffee cups full and our orders promptly delivered. 1. Dana’s can get busy, especially in the summer and during fall colors, when the tourists gravitate there due to their location. That said, they are usually less busy than some of the other perenially busy places (like Lou’s). 2. They are seasonal, and are open from (approximately) Mother’s Day to Columbus Day. During the winter they are closed (and, seeing that much of the seating is on a porch, understandable). 3. Dana’s is also a strict “Breakfast only during Breakfast Hours” joint. At some point in the late morning (usually 11:15, but we’ve seen it as early as 10:30), they hang up a sign announcing that breakfast is over, and they won’t be serving again until lunch. We’ve been bitten by this more than once, and for this review we barely snuck in under the wire. If you are really craving breakfast, err on the early side. So, despite some of the quirks, this really is one of my favorite breakfast joints around here, and on the short short list of places to take out-of-towners for a good meal. On our recent trip to London, we decided to take a day trip out to Greenwich. After we were done with the Greenwich Tunnel (walk under the Thames…), Maritime Museum, and the Observatory, we went back down the hill to downtown Greenwich. One of the features of downtown is the Greenwich Market, which is filled with all sorts of art vendors and food stands. A bit touristy, we did like the place. I ended up buying a ring made of a recycled one-shilling coin, and Carol bought a nice felted wool coat, so it was also a shopping success.